Disclaimer: As a product reviewer for Commute By Bike, I am providing my unbiased opinion of any products provided to us by any company. I do not posses any type of relationship with the product’s company or parent companies. Companies that send in their goods to be reviewed do not compensate me in any way. 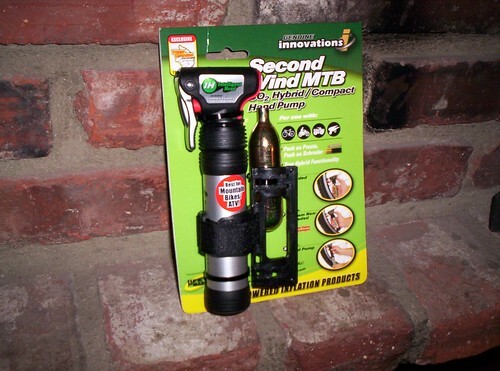 Advertised as: New for 2005, Genuine Innovations is offering a new hybrid inflator, the Second Wind MTB. 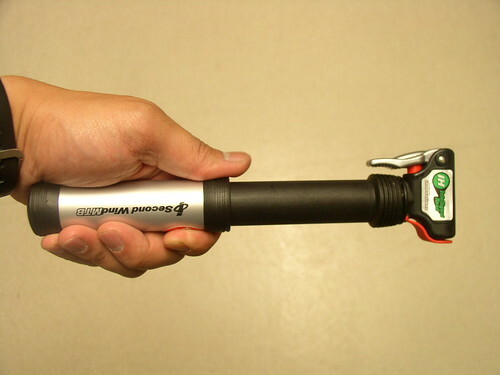 Hybrid inflation taken to a new level – new integrated CO2 hand pump technology allows you to inflate using either the CO2 or the hand pump feature simultaneously without removing the CO2 cartridge. Designed for performance minded mountain bike riders as well as ATV/quad and motorcyclists alike! Comes with one 16g CO2 non-threaded Genuine Innovations CO2 refill cartridge. This pump can supply a maximum of 60 PSI (4.13 Bars). 12 gram Threaded, 16 gram Non Threaded, 16 gram Threaded and 25 gram Threaded Genuine Innovations Co2 refill cartridges. Aluminum, and high strength, glass-reinforced nylon, with brass valve internals. First Impressions and Comments: I was so surprised to see how small the pump was. At first, I was skeptical on how well it would work. I didn’t think that such a small pump could reach the 60 PSI as advertised. But once I tried it, I was a true believer. With the use of a 16 gram Co2 cartridge, a completely flat tire was inflated within seconds. I was so surprised on how well it worked. From that day on, everywhere I rode, the Genuine Innovations Second Wind MTB was strapped to my bike. I plan on buying a second pump to put on my wife’s bike. 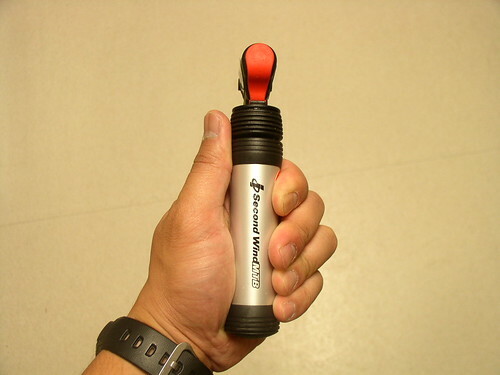 I definitely recommend anyone to switch their bike pump for the Second Wind MTB. Weaknesses: During the testing period, the only issue I found with the Second Wind MTB was acquiring new Co2 cartridges. Neither of the local bike shops or sports stores carried the required cartridge size. The only place I found them was in a motocross dealer. Ordering online would have been easier, but I wanted to see where else I could find them. For 16gram threaded carts check your local walmart in the boating section of the sporting goods or other marine stores. They’re also used in life vests. I did go to Wally World but was always directed to one area of the sporting goods section. When I asked for Co2 cartridges, everyone points right over to the paintball and pellet guns. I didn’t even think to look in the boating section. Thanks Steve. I’ll have to check that out tonight.